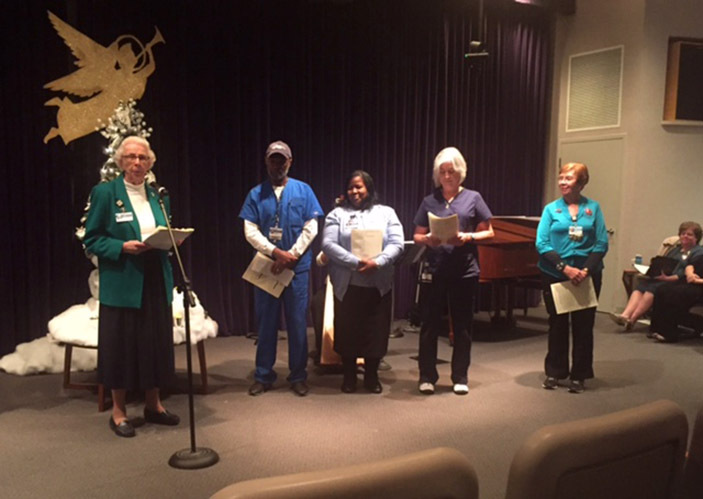 The Emory Saint Joseph's Hospital Auxiliary hosted the 34th annual Light of Love Celebration with two ceremonies, honoring Chaplain Georgia Newman and the Pastoral Care department, as well as remembering the Auxiliary volunteers who passed away in 2016. The Light of Love at Emory Saint Joseph's raises thousands of dollars through the sale of Christmas lights purchased by community members and employees in honor or memory of loved ones. The lights are then placed on the holiday tree in the main lobby, and the Light of Love honorees designate all proceeds from the fundraiser to be used at Emory Saint Joseph's. 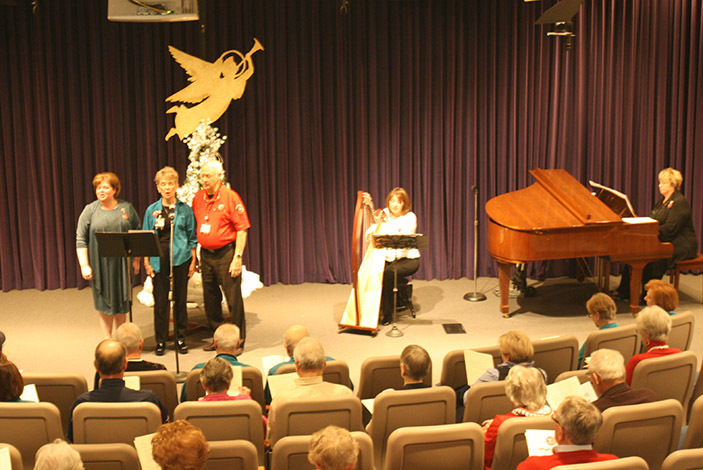 Proceeds from this holiday tradition in previous years have been used to purchase and install new information boards in patient rooms, golf carts to transport patients and families on campus and for the renovation of the hospital's chapel. "Pastoral Care is a wonderful ministry," says patient advocate Sister Denis Marie Murphy, "and the chaplains listen, provide encouragement and counseling and pray with the patients and their families. They spend long hours being there not only for the patients, but the staff as well. Georgia's special gift is her generous spirit and her deep faith has been a blessing to this hospital." 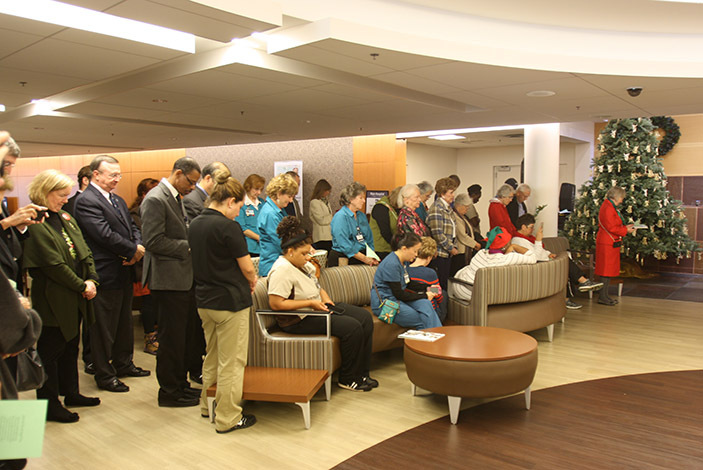 During the remembrance ceremony, each deceased volunteer was recognized individually for their years of service and caring for patients and their families. Additionally, family members and friends of each volunteer attending the ceremony were presented with roses and a lighted angel in their memory. 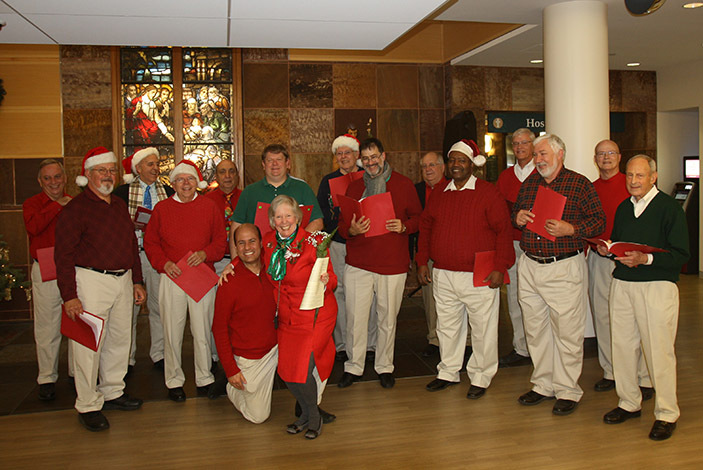 "These Auxiliary volunteers did tremendous work each and every day at the hospital, and they were the embodiment of our mission," says Heather Dexter, CEO of Emory Saint Joseph's Hospital. "They were an important part of our family here, and we are grateful for their service. They were gracious and generous with their time and in addition to patients, they also took care of our doctors, nurses and staff." Since its founding in 1951, the Emory Saint Joseph's Auxiliary has served patients and families by supporting the hospital with donations of more than $6 million dollars. These monetary gifts have been used to provide educational scholarships as well as purchase hospital equipment, furnishings for various areas, Courtesy Carts to transport visitors on campus, the Mobile Mammography Unit, renovate the guest lobbies and more. Auxiliary members volunteer in a variety of areas around the hospital including transportation, admissions, greeting patients and families arriving for surgery or doctor's appointments, providing directions for visitors on campus, operating the gift shop and assisting nursing units and physicians. The Light of Love fundraiser will continue through January 5, 2017, and to purchase lights in memory or honor of a loved one, call Emory Saint Joseph's Auxiliary at 678-843-7292.